The elliptical galaxy M87 is known for a jet of radiation that is streaming from the supermassive black hole (SMBH) that the galaxy houses. This jet, which is visible through large-aperture telescopes, may have functioned as a black hole ‘jetpack’, moving the SMBH from the center of mass of the galaxy – where most SMBHs are thought to reside. Observations taken with the Hubble Space Telescope by a collaboration of astronomy researchers at Rochester Institute of Technology, Florida Institute of Technology and University of Sussex in the United Kingdom show the SMBH in M87 to be displaced from the center of the galaxy by as much as 7 parsecs (22.82 light years). This contradicts the long-held theory that supermassive black holes reside at the center of the galaxies they inhabit, and may give astronomers one way to trace the history of galaxies that have grown through merging. What caused M87’s SMBH to wander off so far from the center of the galaxy? The most likely cause is a merger between two smaller supermassive black holes sometime in the past. This merger could have created gravitational waves that gave the engorged black hole a swift kick. Elliptical galaxies like M87 are thought to become the size they are through the merger of smaller galaxies. Another theory is that the jet of radiation that sprays out of the SMBH has pushed with enough energy to essentially propel the black hole away from the center of M87. Okay, so it’s not really a ‘black hole jetpack’, but you have to admit that the combination of black holes – which are cool – and jetpacks, also cool, is too good to pass up. The motion of the SMBH happens to be in the opposite direction of the jet that we can see streaming from the object. For this scenario to be true, however, the jet would have to have been much more energetic millions of years ago, the researchers concluded. There also does exist evidence for another jet of material that is streaming out of the other side of the SMBH, which would cancel the pushing motion of the jet that we can see, making the merger scenario much more likely. If the two jets were asymmetric to a high degree, however, this scenario still may be the case. More information on the structure and history of the jets would better clarify the cause of the black hole’s displacement. The displacement of such black holes would be apparent in archived Hubble Space Telescope images, and the researchers that discovered this phenomenon in M87 used the HST archives to pinpoint the location of the SMBH. Further analysis of these archives could yield many, many more ‘wandering’ black holes. These findings were presented on May 25th at the American Astronomical Society meeting in Miami, Florida. The team of researchers that collaborated on the finding include Daniel Batcheldor and Eric Perlman of the Florida Institute of Technology, Andrew Robinson and David Merritt of the Rochester Institute of Technology and David Axon of the University of Sussex. Their results were accepted for publication in Astrophysical Journal Letters, and the original paper, A Displaced Supermassive Black Hole in M87, is available on Arxiv right here. Again, Nicholos, nice article; as Spock would say: Fascinating! When the antecedent is human, the relative pronoun who should be used instead of “that”. Given that galaxy mergers (major mergers specifically) seem to be the predominant mechanism behind AGN activity in galaxies, displaced SMBHs are, as noted above, probably the norm. Occupying the bottom of the gravity well in the Virgo Cluster, M 87 has likely undergone several major and many minor mergers in the last 10 Gyr. Mass estimates and the enormous concentration of globular clusters are two obvious indicators of past mergers in M 87, as is the jet. Due to its proximity to us, Hubble was able to detect the displacement of M 87’s SMBH in visible light. Cool beans! But what would M 87 look like several billion years ago? or hence? 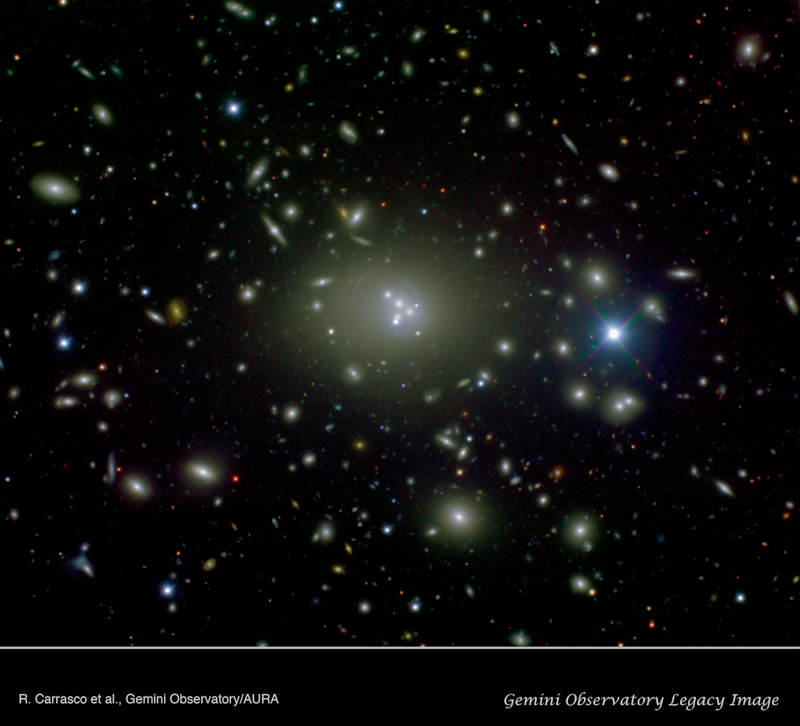 Astronomers using the Gemini-S scope recently discovered a giant cD galaxy (similar to M 87 in mass) with multiple nuclei in Abell 3827 ( http://www.gemini.edu/images/pio/20100506_abell_3827.jpg ). I like to think that M 87 may have appeared like this galaxy at some point in it’s life, had it been ‘caught in the act’ so to speak. Nice piece, Nick. If you want to get technical, even your method is incorrect. As the sentence states, “a team of researchers” and “collaborated”; which is basically the same thing so say one or the other.. Also, you don’t “collaborate” on a finding… you “collaborate” with others, hence it is the collaboration (sic) of INDIVIDUALS (which) RESULTS / CREATES (in) the finding. We American’s can really mess up our own language. I read the paper, and they looked through 4 main variables. However, one they didn’t look over would have been the first I researched. We know stars “wobble” somewhat from the center of their own system due to the gravity pull from their own planets. Now the paper hinted at nearby stars etc, tugging on the SMBH, however they didn’t take into effect the galaxy as a whole, including each galaxy’s effect from “dark matter” (seemingly) keeping the outer rim together. Perhaps this along with “jetting” can cause some off-ball wobble. I also wonder, knowing galaxies do move, that perhpas there is some disruption of space time and therefore the gravity around a black hole as it moves through the universe. If it is moving and “tugging” a billion stars behind it, would it be in the center of the galaxy, or would it be slightly off center?? …since it would be moving towards the stars in one direction, and away from them in the opposite. Although this paper is sound in thought and math. I believe they left a couple of variables out which deserve some consideration. Also, when you start to have more than several variables, you need to consider the consolidation of at least a couple of them working together. Observations taken with the Hubble Space Telescope by a collaboration of astronomy researchers at Rochester Institute of Technology, Florida Institute of Technology and University of Sussex in the United Kingdom show the SMBH in M87 to be displaced from the center of the galaxy by as much as 7 parsecs (22.82 light years). M87 is some 60 million lighyears distant. As Hubble´s mirror has a diameter of 2,4 m, its angular resolution is 0,05 arcseconds. To be able to “see” something as long as 7 parsecs at a distance of 60 million lightyears, this mirror´s diameter should be a hundred times greater. Further, I would rather like to know by means of which detector of the Hubble telescope the location of the SMBH in M87 was spotted (IR, optical, UV)? The most likely cause is a merger between two smaller supermassive black holes sometime in the past. This merger could have created gravitational waves that gave the engorged black hole a swift kick. So it’s not a jetpack but a gravpack. Even cooler! Also, the merger itself should give momentum changes to the previous central SMBH, I think. If it is moving and “tugging” a billion stars behind it, would it be in the center of the galaxy, or would it be slightly off center?? They are using the photocenter of the galaxy as the center. this mirror´s diameter should be a hundred times greater. The smaller error is that the distance of 16.1 +/- 0.2 Mpc they give to M87 is ~ 3.26*16.1 ~ 52 Mly. Also, they use model fitting to achieve 0.2 pixel resolution of offsets. From earlier UT articles I believed that was standard methodology. Mainly the ACS, which apparently has 0.027 arc” resolution. The filters and their effects are given in the paper. I’m sure the Hubble sites will tell you what that means in terms of wavelengths et cetera. I know…it supports my point! …but–it is rather hard to get an exact/perfect photographic center unless the shot is taken exactly above the object, and the object’s plane is perfectly perpendicular to the camera! …I’m thinking this isn’t the case from the Earth’s vantage point. A slight tilt in the plane of the object, and a photographic point off the central axis just a bit will cause some error. It takes time for gravity to reach the other stars. If the black hole is jet propulsed then it will many many many many many years for the stars at the other side of the galaxy realizes that the black hole moved and act on it. 22.82 ly is an awful small distance.